Founder of the Mind Body Method (MBM), published author, coach trainer, leader in the field of Equine Facilitated Learning, and life coach, Kathy brings over 15 years experience in the field of human development and personal growth. Her compassionate, intuitive, and cutting edge approach in working with individuals provides her clients access to their deepest level of truth, power, and ability to live with purpose and passion. Kathy’s Mind Body Method integrates all of the information and knowledge within a persons experience bringing clarity and immediate results. Kathy offers coaching, workshops, and training programs for individuals and groups, by phone, teleclasses and in person. She is prolific at developing worksheets and learning aids for all of her programs. Her professional training courses include the Mind Body Method, a coach training course designed for life or professional coaches and individuals in helping professions. She is a leader in the field of Equine Facilitated Learning and Coaching (EFLC) and provides train the trainer programs for individuals wishing to employ horses in programs focused on human development. A diverse approach to accessing human potential has grown from Kathy’s experience as a coach trainer for CoachU, and a teacher at the Boulder College of Massage Therapy, Naropa School of Extended Studies, and Colorado Mountain College. Her corporate training includes a certificate for the Coaches Clinic, through Corporate CoachU. Kathy has spoken at several ICF international conferences along with several regional and local organizations. As a leader in the field of EFCL she present her Mind Body Method and other key concepts of self-awareness at national conferences. She founded the Mind Body SIG that grew to a virtual membership of 350 coaches and hosted authors such as don Miguel Ruiz. When Kathy is not teaching or coaching you can find her training her wild mustang, Corazon, or trail riding with her quarter horse, Moon. You might also find her skiing the mountains of Colorado, rafting rivers, or hiking the local trails. Her hobbies include painting, yoga and cooking. Kathy’s publications include Hope…From the Heart of Horses: How Horses Teach Us About Presence, Strength, and Awareness, which focuses on the power of horses to help humans grow came out in Spring 2009. 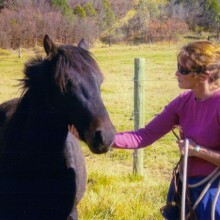 This was followed by a book Kathy wrote with several author equine experts featured here on the site, Horse As Teacher: The Path To Authenticity.